Fungal spoilage during the storage of fresh produce is a major concern in the food industry. Several methods have been used in order to improve and increase the shelf-life of food such as pesticide treatment, but the safety issues and concerns about these methods has been questioned due to their observed ill effects on consumer health and environment. Thus, it leads to emergence of a novel alternative residue free treatment. Ozone is known to be a powerful oxidising agent having the ability to break down into harmless oxygen and interestingly leaves no residue. The potential of ozone to reduce food spoilage organisms is well documented and the use of ozone against food spoilage has been approved by US-FDA. The impact of ozone exposure on macroscopic development and morphological characters of such organisms are yet to be understood. This study was carried out to elucidate the effect of continuous gaseous (180 - 200 ppb) ozone exposure on fungal development of different strains. Four different genera (Penicillium, Fusarium, Mucor and Cladosporium) were identified from fourteen different strains by using molecular techniques which were aseptically isolated from various types of produce. 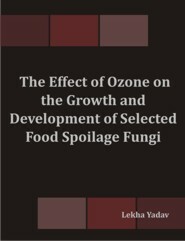 The effects of continuous ozone exposure on radial growth, spore production and micromorphological modifications were observed with both spore and mycelial inoculum. Variations in growth pattern were observed due to behavioural differences of different species under ozone induced oxidative stress. However, significant differences were observed with reduced fungal growth in most of the isolates especially in Penicillium sp. whereas, suppressed spore production (> 50%) in eight isolates were observed. In addition, morphological modifications were also observed in the isolates grown under ozone. Therefore, ozone can be efficiently used for controlling and inhibiting food spoilage during storage. Hence, more research needs to be done to reveal the reason for these variations among species.